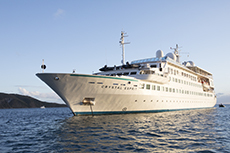 The Crystal Esprit offers an intimate and elegant enclave while welcoming just 62 sophisticated travelers in all-suite, butler-serviced accommodations. The yacht's unique size brings guests to the very doorstep of some of the world's most exclusive shores, allowing for incomparable personalized experiences. The Crystal® Yachting Lifestyle celebrates dining with a savory combination of cuisine and conversation that together foster unique experiences in a relaxed environment of engaging camaraderie. Lavish culinary presentations of Michelin Star level will be enjoyed in an elegant dining room or one of two carefree al fresco cafés. Bars and Lounges will be welcoming, convivial spaces of elegant comfort, from the al fresco Sunset Bar with its aft location on the ship's top deck and The Cove, the yacht's premier gathering place to enjoy a drink and share stories of the day.